Chester epitomizes my internalized concept of a neighbourhood TTC subway stop: functional, unassuming, and perhaps even austere. It doesn’t aspire to handle the pell-mell rush of heavy crowds, but rather it embodies the quieter rhythms of the Greektown community to which it is central. 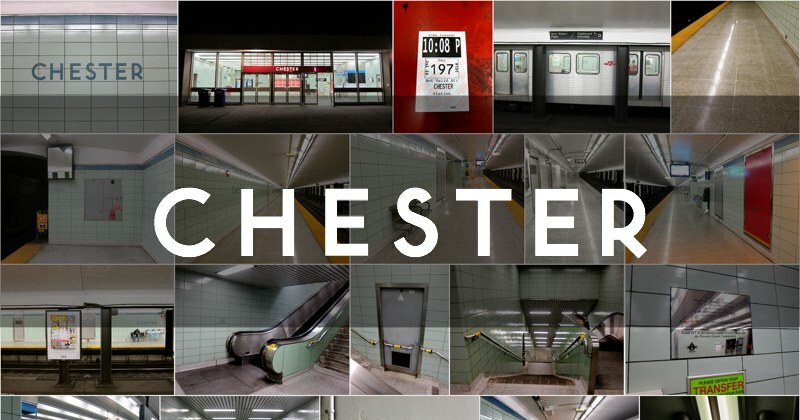 Opened in 1966, Chester is the least-used subway node along the Danforth segment of the line. Not being connected to any bus or streetcar routes—somewhat uniquely—it probably only comes alive once a year, during the Taste of the Danforth street festival. When I visited, every inch of the 50 year old station was spotless, albeit careworn and faded, and occasionally rust-damaged. Whoever the crew is that maintains Chester, they have pride. The station doesn’t exhibit any artwork, but a memorial plaque for Jimmy Trajceski hangs near the entrance. Trajceski often worked at Chester station, but was shot and killed while covering for another employee, at Victoria Park station in 1995. It was the first on-duty TTC slaying in Toronto’s history. Chester, named for the former Village of Chester—annexed in 1909 to the City of Toronto—is a bland shell compared to many other TTC stations (it doesn’t even have a mezzanine level), but you get the feeling it is quietly appreciated by those who use it.